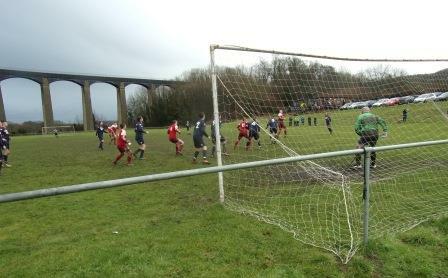 Lying humbly in the awning of the magnificent Thomas Telford construction – the Pontcysyllte Aqueduct – is the Welsh National League side Acrefair Youth; neither a youth team, nor pronounced Aker-fare. Only a pitch really, but with one of the best backdrops in England and Wales. The canal boat bridge, pronounced Pont-cuh-sell-tee (give or take some spittle) was constructed between 1795 and 1805. It is both the longest and highest aqueduct in the UK, a Grade I listed building and World Heritage Site. It sits upon 18 piers made of local stone, which rise 38 metres up to the ironwork. 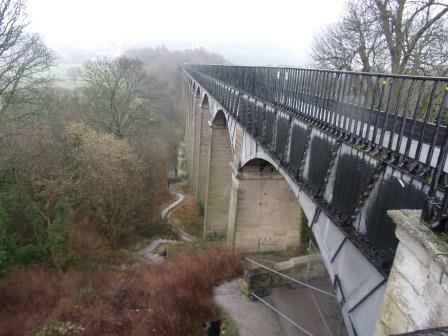 The bridge carries the Llangollen canal in a cast iron trough, 307 metres long, 3.4 metres wide and 1.6 metres deep. Water is fed from the river Dee at Horseshoe Falls near Llangollen. Access to the aqueduct is through Trevor Basin, not a person, a canal wharf, round the back of the ground (Gate Road) and up the hill (B5434) in the village of Trevor (twinned with Keith and Barry). The Telford Inn lies here too (but disappointingly only sells real ale in summer). It’s a short walk through the boatyard to the aqueduct. Only one side has a footpath, with side rail. The other side is a foot wide ledge and no rail. It’s a scary walk, the thin railing to ones left doing little to assuage the fear of the 126 foot sheer drop beneath. Unfortunately the ground lies directly beneath the other side; I would’ve swam across and teetered precariously on the ledge to get a pic in… but didn’t know how to keep my camera dry. Acrefair (acra-vire or acra-vee as the manager kept shouting) have averaged six goals per game this season, including a 3-8 and two 1-12 reverses (both to Point of Ayr). I had my usual arresting effect on goal flow. 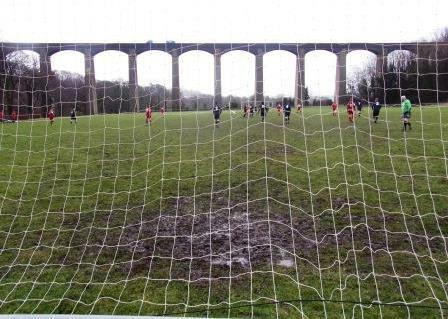 My attendance and the absolutely sodden pitch made play difficult and limited the clear cut chances on goal. That and the new Acrefair keeper, whose large frame belied his nimbleness, kept the score down to an unusual low for the Bont. I shouldn’t complain really, as the fact the game started at all was something of a miracle. An hour before kick-off as I wandered around the boatyard, a massive storm complete with thunder, lightning and torrential rain, unleashed itself onto an already borderline pitch with an irritating relentlessness. I sat in the Telford Inn miserably expecting to be driving home again shortly. Amazingly, as I turned into The Bont’s car park, everyone was still there. The weather had relaxed somewhat into a squall and it seemed that nothing was stopping the game commencing. The two goal areas were riddled with standing water and with the rain continuing intermittently, it was difficult to believe the game was going to finish, let alone start. The ground is just a railed pitch, but with a sizeable 30 degree bank on the entrance side. 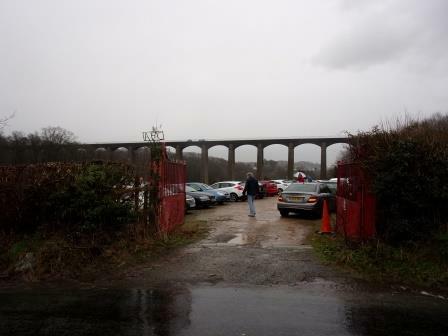 A car park holding around 20 cars sits atop the pitch, spanning the length, but very narrow. The clubhouse sits at the back near the aqueduct. The entrance is right off the country road, a red gate, with a thin steel sign saying AFC – suggestive of an earlier incarnation being just Acrefair FC? The visitors were FC Nomads of Connah’s Quay, a new team who are still 100%, with eight wins out of eight now and a 48 goal difference. Acrefair started well, but of late have been letting in as many goals as FC Nomads have been scoring. 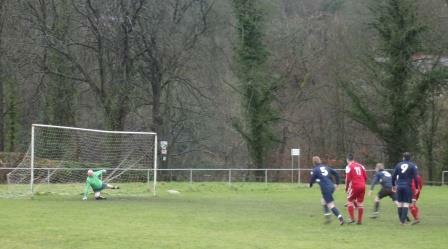 Nomads took the lead after eight with a penalty but missed opportunities and a cut up pitch prevented further goals. An OG and a close range finish in the second half made it 0-3, which was bitterly disappointing for me as I half expected a double figures rout. The Bont should be a rite of passage for all groundhoppers. It’s only a railed pitch, no programme, no entrance fee, but one hell of a setting. 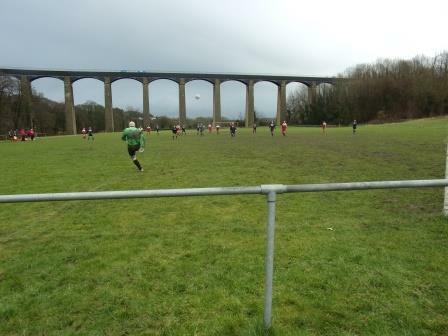 This entry was posted in Travelog and tagged Acrefair Youth, FC Nomads of Connah's Quay, Llangollen Canal, Pontcysyllte Aqueduct, The Bont, Thomas Telford, Welsh National League. Bookmark the permalink. Unlike Nigel this is a new pitch to me. Great backdrop and great find!